About the Certified Applicators of Prairie Boys Spray Foam. Prairie Boys Spray Foam is your team of spray foam insulation applicators in the Regina Saskatchewan area. For customers throughout Saskatchewan, we know the only thing as important as choosing eco-friendly spray foam insulation for your home or business is finding the right applicator. You’ve come to the right place. Beyond industry certification, our applicators undergo in-depth, comprehensive training to learn about the science behind polyurethane spray foam. Spray Foam Insulation services from Prairie Boys Sprayfoam can improve the energy efficiency of any building, whether it be your home or cottage, a large multi-unit residential or commercial building. Spray Foam Insulation is ideal for shops, basements, crawlspaces and exterior walls, acting as a vapour barrier, air seal and insulation all in one. We pride ourselves on quality service and workmanship, and also using the most up to date quality products and technologies. All of our installers are certified by the highest standards following the strict guidelines of CUFCA Canadian Urethane Foam Contractors Association. Although spray foam insulation is most often used for insulating hard-to-reach areas of building constructions, such as cathedral ceilings, homes which use environmentally-friendly spray foam for all insulation are healthier and have more effective thermal insulation as well as air and vapor barriers. These three important properties are rolled into one with the application of spray foam insulation, and not only is the foam we offer made of renewable materials and free of harmful chemicals such as bleach – our foam can help to reduce your energy consumption, and thus expenditure. Polarfoam Soya which we supply is ‘closed cell’ foam, meaning that it stops convection currents. This means that if you insulate your home using our foam, problems such as mold and condensation in your home’s interior will be less likely occurrences. Closed cell foam also has higher strength than open cell foam, and thus using this type of material for insulation will give you a more resilient result. Even though Polarfoam Soya is environmentally-friendly, it does not sacrifice functionality for ecological respect, and can provide you with the best insulation you could ask for. A standard polyurethane foam spray may contain Ozone-depleting blowing agents which have a negative impact on the environment. In Canada, Polarfoam Soya is the only material of its kind which does not compromise the Ozone layer – it uses zero Ozone-depleting substances in order to spray over structures. Polarfoam Soya, unlike certain Polyurethane foam insulation materials, is applied in liquid form. It is thus able to provide consistent, solid cover which keeps every crack and hole filled. Our Polarfoam Soya will provide a continuous seal, for the maximum possible insulation. 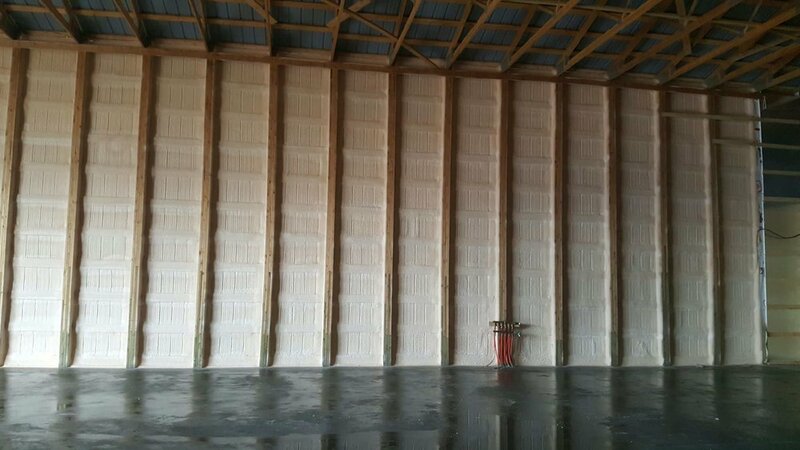 While open cell foam has its uses in certain industries, closed cell is preferable in insulation as its solid construction serves to limit the passage of humid air through to walls, and thus prevents common problems caused by humidity. Just three inches of closed cell foam can stop 95% of heat loss due to conduction, and only a quarter of an inch is needed to stop 99% of heat loss due to convection. With this thermal efficiency, your power consumption can be greatly reduced. We are building a cabin at Fishing Lake and had Prairie Boys Spray Foam insulate for us. Cody and I talked regularly on the timeline. Cody made a trip just to look at the job site and see where we were at. He was very informative in the process and the product; we hired him without even meeting! Cody and his team arrived to do the job, called us to make sure we were all on the same page. I appreciated his professionalism and their great work effort is a great asset for this company! Cody and his crew from Prairie Boy Spray Foam came out and sprayed the walls/roof of our new shop/office space. Top notch and Excellent work, we were very impressed. They taped off all the windows and doors to protect them from over spray, and scraped the studs. Cody is Very knowledgeable and willing to answer any questions you may have.They swept up and cleaned any mess before they left. Benefits of Foam Insulation – What is Spray Foam? Simply put, SPF (spray polyurethane foam) is the most efficient and cost-effective insulation you can put into your home. It’s made from liquid elements which, when combined, become a foam that expands 20 to 30 times its liquid state – filling cracks and areas traditional insulations just can’t reach. SPF is most commonly applied to the walls, floors and ceilings of a building. An improperly insulated home is more prone to moisture buildup in walls. This moisture is what allows different varieties of molds to grow – molds that pose real health problems for you and your family. Some produce allergens causing reactions and even asthmatic attacks, while others are known to contain toxins and irritants. Once there, ridding your home of mold is both difficult and expensive. The tight seal that spray foam provides is without a doubt the most effective way to prevent mold from ever growing in the first place.